George Simler was born on February 16, 1921, in Johnstown, Pennsylvania. He enlisted in the U.S. Naval Reserve in July 1939, and went on active duty in the Navy in June 1941, serving at NAS Philadelphia, Pennsylvania, until enlisting in the Aviation Cadet Program of the U.S. Army Air Forces on December 18, 1941. After completing flight training he was commissioned a 2d Lt and awarded his pilot wings at Maxwell Field, Alabama, on August 5, 1942. Lt Simler served as a B-26 Marauder pilot with the 451st Bomb Squadron in England from August 1942 to November 1943, followed by service as Operations Officer for the 451st in England from December 1943 to May 1944. He then served as Commander of the 451st Bomb Squadron in England from May 1944 until he was forced to bail out of his aircraft over enemy territory in July 1944. After evading capture for two months, Maj Simler made his way back to Allied lines in September 1944. His next assignment was as Assistant Engineering Officer and then Maintenance Officer with the 332nd Army Air Force Base Unit at Lake Charles AAF, Louisiana, from November 1944 to February 1945, followed by service as a Production Line Maintenance Officer and then Superintendent of Aircraft Maintenance with the 138th Army Air Force Base Unit at Lake Charles from February to November 1945. He served as an instructor pilot at Bolling Field, Washington, D.C., from December 1945 to March 1946, and then served as Commander of Squadron L with the 35th Army Air Force Base Unit at Memphis Municipal Airport in Memphis, Tennessee, from March to June 1946. His next assignment was as Professor of Aerospace Science and Tactics and then as a student at the University of Maryland from September 1946 to June 1948, followed by service as a Project Officer, Assistant, and then as Executive Officer with the Deputy Chief of Staff for Personnel, Headquarters U.S. Air Force, in the Pentagon from June 1948 to June 1951. Col Simler served as an F-84 Thunderjet pilot with the 86th Fighter Bomber Wing at Landstuhl AB, West Germany, from July to October 1951, and then as Commander of the 527th Fighter Bomber Squadron at Neubiberg AB, West Germany, from October 1951 to June 1952. His next assignment was as Commander of the 86th Fighter Bomber Group at Landstuhl AB from June 1952 to July 1954, followed by service as Director of Personnel, Plans & Requirements and then as Director of Requirements and Training with Headquarters Air Defense Command at Ent AFB, Colorado, from August 1954 to July 1956. Col Simler served as Base Commander and Commander of the 355th Fighter Group at McGhee Tyson Airport, Tennessee, from July 1956 to August 1957, and then as Director of Athletics at the U.S. Air Force Academy from August 1957 to August 1960. After attending National War College in Washington, D.C., from August 1960 to June 1961, he served as Commander of the 6313th Air Base Wing at Kadena AB, Okinawa, from July 1961 to April 1962. He served as Special Assistant to the Commander of the 313th Air Division at Kadena from April to June 1962, followed by service as Commander of the 18th Tactical Fighter Wing at Kadena AB from June 1962 to June 1964. 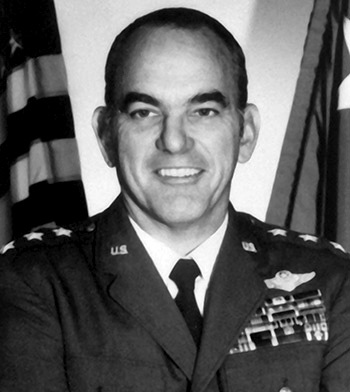 Gen Simler next served as Commander of the 4520th Combat Crew Training Wing at Nellis AFB, Nevada, from June 1964 to June 1965, and then served as Director of Operations with Headquarters 2nd Air Division and then 7th Air Force at Tan Son Nhut AB, South Vietnam, from June 1965 to August 1966. His next assignment was as Deputy Director of Operations and then Director of Operations with Headquarters U.S. Air Force in the Pentagon from August 1966 to July 1969, followed by service as Vice Commander-in-Chief of U.S. Air Forces in Europe at Wiesbaden, West Germany, from July 1969 to August 1970. His final assignment was as Commander of Air Training Command at Randolph AFB, Texas, from September 1970 until he was killed in the crash of a T-38 Talon on September 9, 1972. Gen Simler was to take command of Military Airlift Command at Scott AFB, Illinois, three days later. He was posthumously promoted to the grade of General (O-10). George Simler was buried at the U.S. Air Force Academy Cemetery in Colorado Springs, Colorado. For outstanding and meritorious achievement while participating in aerial flight against the enemy on 31 December 1943. Captain Simler piloted the lead plane in a large formation of B-26 type aircraft against heavily defended installations in occupied Europe. As the formation approached the objective, it encountered heavy concentrations of ground fire, and a burst of flak pierced the left engine of Captain Simler's plane. Without hesitation, Captain Simler, feathering the disabled engine, continued the bombing run, maintaining the lead of the formation until the bombs were released. By his tenacious devotion to duty and his superior flying skill, Captain Simler ensured the success of the mission, and his fearless leadership is exemplary of the highest traditions of the Army Air Forces.